Updated: Nov. 27, 2015. For latest on company's apology go here. It's a caribou skin parka originally made to offer spiritual protection to an Inuit shaman named Ava. 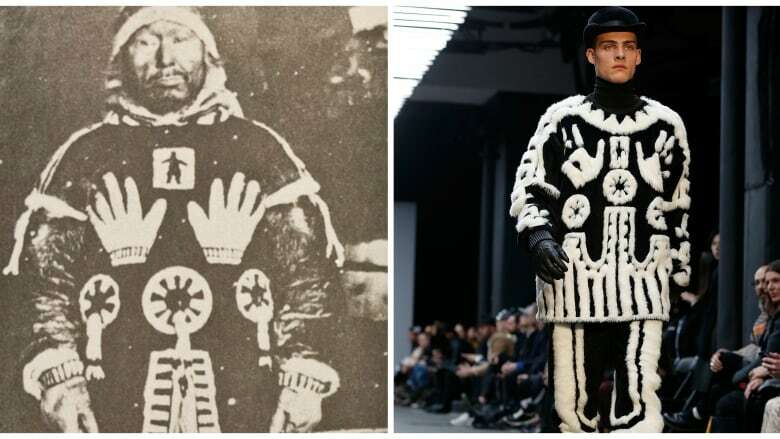 But now a Nunavut family has discovered that high-end European clothing designer, Kokon To Zai, has been selling the sacred design as a sweater. They say the pattern is an exact copy of their relative's parka -- and it was made without their permission. "I was furious. I was angry. I was upset. I was in shock, most of all," Salome Awa tells As It Happens host Carol Off. "It was an exact duplicate copy." Awa is a producer with CBC North in Iqaluit and the great-granddaughter of the shaman. Awa's great-grandfather envisioned the design in the early 1920s. Awa says he thought someone was going to drown him. The pattern of the hands on his chest and little man in the middle of the parka were safeguards. "It's a protection parka," Awa explains. "Only him himself thought of it and wanted to design it, so he can save his life." After checking with her family, Awa is confident no contract was arranged with the fashion designer and that the company never requested the rights to use the design. "This is a stolen piece," Awa insists. "There is no way that this fashion designer could have thought of this exact duplicate by himself." There are photos of her great-grandfather published in books and online, but Awa suspects the designer may have stolen the intricate design from Journals of Knud Rasmussen. The film profiles the Danish explorer who met with her great-grandfather in the Canadian arctic. "I really don't know, but Ava was a well-known world shaman person and his image is out there." Awa has tried to contact the designer, but no one has returned her calls. As It Happens also requested an interview but no one was available. Since the story broke a number of people have voiced their anger on Kokon To Zai's Facebook and Twitter pages. The garment is also being sold at the Canadian retailer CNTRBND which has stores in Toronto and Vancouver. It retailed for $925 CDN. Shortly after this update was published, CNTRBND removed the sweater from its website. Owner Christopher Casuga told As It Happens on Thursday afternoon he's pulling all items from the sales floor. Awa is shocked by the price of the garment, but is particularly upset about the context in which the design is presented. "I checked the KTZ fashion design Facebook page and they have famous people wearing his clothes," she says. "I'm just baffled by all this." 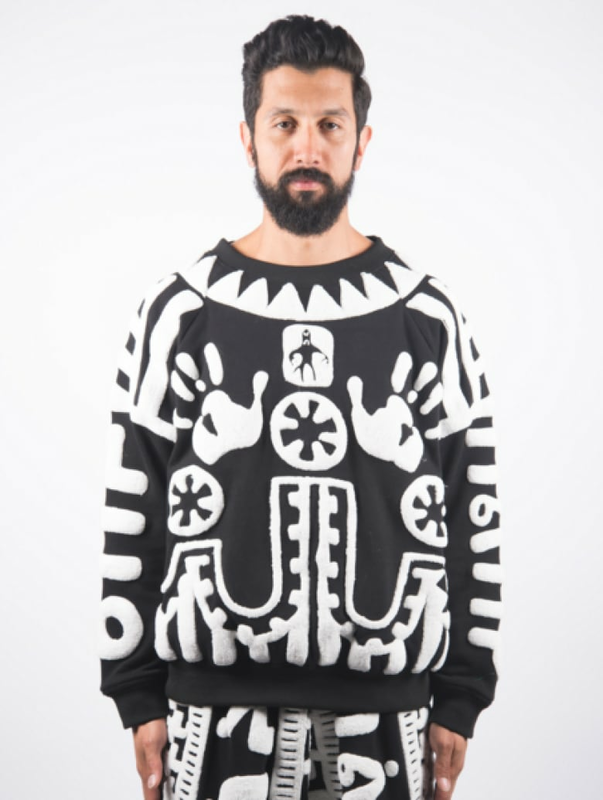 This is not the first time KTZ has been criticized for using indigenous designs. The company claims their patterns "capture the beauty, truth and power behind indigenous things," acting as a tribute rather than an appropriation of the designs. But Awa dismisses that argument. "These are sacred images that they are using," Awa stresses. 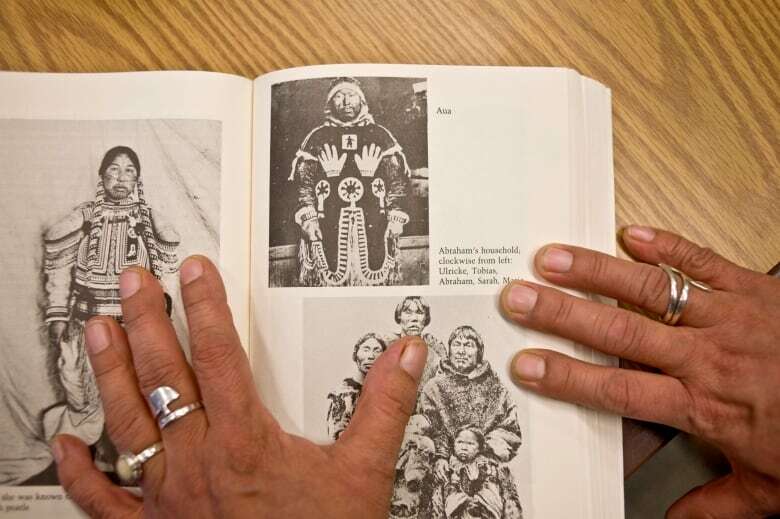 "They are breaking the Inuit sacred laws of duplicating someone else's shaman clothing . . . and for profit of all things."